Like most 90s kids, I most closely associate chia seeds with this. Spread some chia seeds on this terra cotta animal and violà! Your very own [creepy] grass pet. I happened to be partial to Beanie Babies, but hey, if you’re in to that thing, to each her own. Chia seeds are the new black in New York right now. I’ve seen them in salads, smoothies, oatmeal, and yoghurt. They boast benefits such as enhanced hydration, lower blood pressure, reduced food cravings, and Omega-3 potency. If they spill on your counter, you might freak out and think they’re little bugs. Generally, though, they are a great enhancement to your everyday snack. After about a month of living on the chia pudding from Liquiteria, it dawned on me that this was simple enough to create at home and has since become my favorite post-workout snack. It’s a super-easy, one-bowl recipe and could also be a great breakfast (with some granola for the Crunch Factor!) or healthier dessert. Added bonus: the flavor profile will impress the hell out of your friends. Whisk together almond milk, yoghurt, maple syrup, vanilla, and a pinch of the kosher salt in a medium bowl until just combined. Whisk in the chia seeds and let the mixture stand for approximately 30 minutes. If seeds have settled, stir to redistribute. Cover with saran wrap and refrigerate overnight. The following day, stir the pudding and taste. If you’d like it to be a bit sweeter, add a tablespoon of maple syrup at a time to reach desired sweetness. 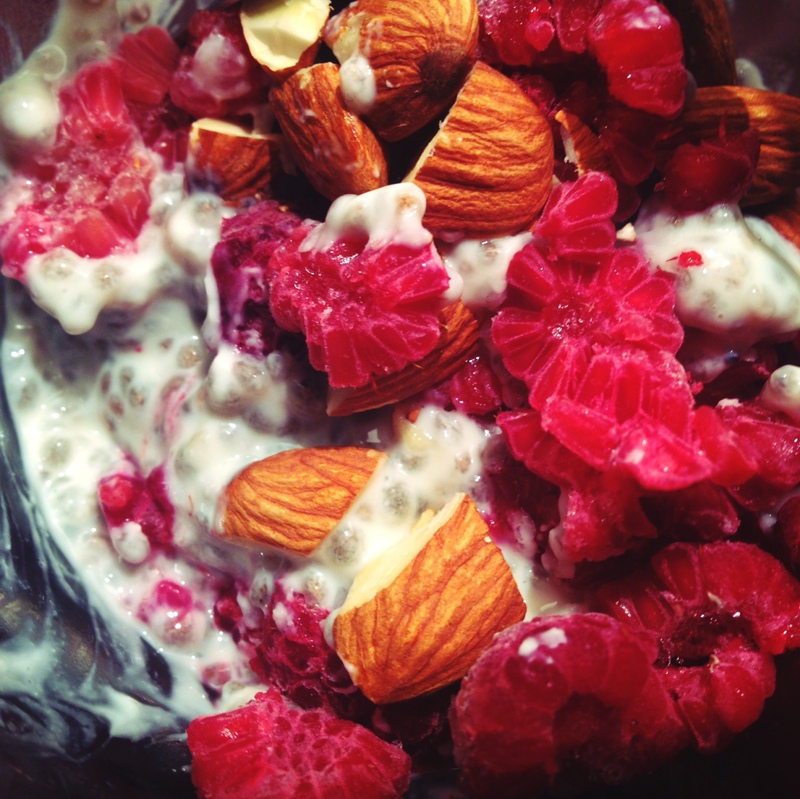 Spoon pudding into a bowl and top with your preferred accoutrements – sliced almonds and raspberries are my favorite. Serve and enjoy! Pudding will keep in the refrigerator for about a week.